If your tote could talk, what would it say? This one says, "I'm hard at work, carrying your onions, books, and workout wear, but come happy hour, I'll tastefully party!" 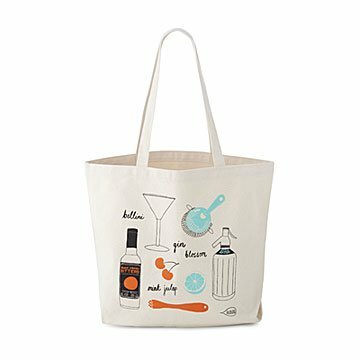 Its playful, subtly sophisticated illustrations of cocktail tools and ingredients—blood orange bitters, cherries, a soda water spritzer, and a cocktail strainer—are drawn by hand on 100% cotton canvas. Market-sized, it'll hold your entire farm stand haul. Sturdy handle straps and a flat bottom make it easy to carry, and non-tippy when you set it down to chat with the farmers—or the bartender.